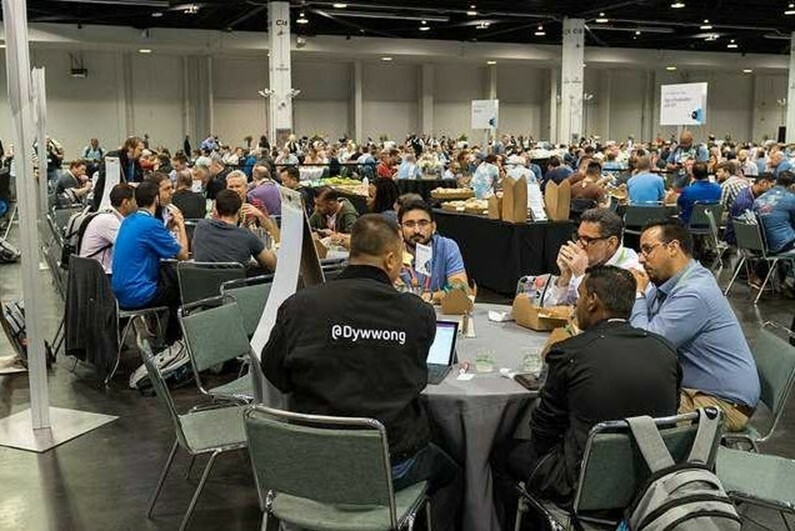 Citrix Synergy 2018 Lunch Tech Chat Recap on Citrix Cloud – Guest Blog Post by Donald Wong! 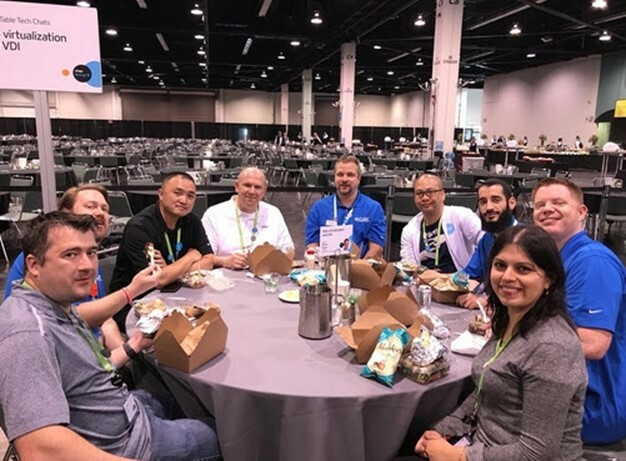 Home / Citrix Synergy 2018 Lunch Tech Chat Recap on Citrix Cloud – Guest Blog Post by Donald Wong! I really didn’t know what to expect since we had no clue who might randomly show up to our tables. That randomness in itself it’s pretty cool as we ultimately got to meet quite a diverse group of people. Robert J., Will A., Semir Z., Chris B., Phil W., Tony P., and Niajaz Z. was the 1st wave of lunch participants who showed up. This was a mix of customers, partners, and interestingly enough a Citrix employee specifically working in the Citrix Cloud team also participated. Best yet! – No more Infrastructure upgrades. Using a canary distribution methodology, releases are distributed with no interruption. One specific pain-point that was brought up is regarding the performance of the Citrix Cloud management portal. Significant sluggishness were perceived by several participants including my experiences in our environment on Delivery Group and Machine Catalog enumeration which at times would take up to a minute to appear and refresh. Because we were fortunate enough to have a Citrix Cloud engineer in our table, we had direct feedback on enhancements that are on the way in the next release to address this specific bug. Several additional participants, Alan H and Gopi B., joined our table discussion toward the back end of the lunch hour. The discussion around NetScaler placement and the move to Citrix Cloud was brought up. The Citrix Cloud offering includes the NetScaler Gateway Service, but you will need to look the specific requirements of your own environment to see if it makes sense or not. If for example today, your organization uses. ns.xyz.com as the gateway for accessing your XenApp hosted apps and VDI sessions, are you ready and willing to use xyz.cloud.com as the URL namespace. Because the Gateway service will be hosted through Citrix Cloud, they will be authoritative for the URL. Additional factors will include placement of Storefront servers for optimal performance. You would want to pair these as closest to your Gateway service as possible. Before I jump into Day 2, here’s some of my colleagues working at the other lunch tables. The 2nd day also brought its share of surprises. Nearly if not all the attendees were from the Middle East (Jordan and Saudi Arabia): Hussam A, Khalifa B., Osama A. A., and Kali S. After a round of introductions, I began to hear an interesting trend. Most of my table’s participants had very little to no knowledge of Citrix Cloud, but were extremely eager to learn more about it. Because of this common theme, I thought it would useful to do some white boarding so I drew out the high level architecture of Citrix Cloud components and it’s offerings. The 3rd day of participants, Neil K., Nathan P., Patrick P., and Kyle E., in our lunch tech chat table engaged in some great discussions. 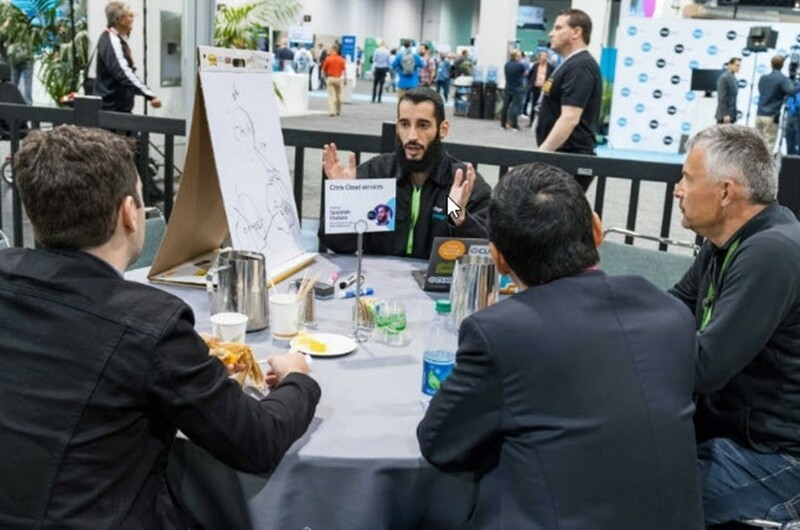 To start it off, one returning Synergy attendee wanted to learn more about AppLayering, got intrigued by Workspace Cloud, and wonder how best to get into these cloud technologies and not do it wrong. Having direct experience, I brought up a complimentary offering by Citrix Customer Success Team which helps work with customers on identifying use cases and success metrics. They are not there to help implement the technical solution, but would drive adoption and give guidance on the path to success. Hopefully, to help you alleviate those “not do it wrong” situations. Several attendees concurred that their organizations are now mandating a cloud first strategy. We have a partner in our table who have successfully completed implementation of Citrix Cloud for their customer as an early adopter. Some take-away is to be aware of the release cycles of Citrix Cloud. Plan ahead and test test test! One table participant has already acquired Citrix Cloud licenses and was fortunate enough to not have an existing Citrix environment. This greenfield scenario offers the most flexibility in building the most modern design. The idea of solely using Cloud as backend infrastructure for VDAs was brought up. If there was ever a time to build clean and leveraging cloud infrastructure, this would be the case. Citrix Cloud integration with Azure, leveraging Smart Scale, offers the ability for customers to use a resource burst model where VDAs can be spun up or powered on from a powered down state on the fly so minimal usage costs would be incurred while not in use. Another benefit would be more accurate OpEx cost and bill-back reporting since you are only charged for what you use. What did we learn from the 3 days of lunch table tech chat discussion on Citrix Cloud? We had 2 dedicated tables and both were filled all days, with a day where there was standing room only. Hint Hint! Every day was a great mix core discussion on Citrix Cloud. Then there were also ancillary discussion topics that went tangent to other Citrix products and features that ultimately can help drive adoption for Citrix Cloud Hey, but this is great because at the end of the day, the other portfolio items in the Citrix family also play key roles in ensuring users are getting the best experience. Toughest question asked by far was around cost of investing into Citrix Cloud since it is a leap of faith for anyone to spend money in order to save money in the long haul, while entrusting a solution to help safe guard their user’s data and still maintain a pristine user experience. Well, this is where it gets way better. 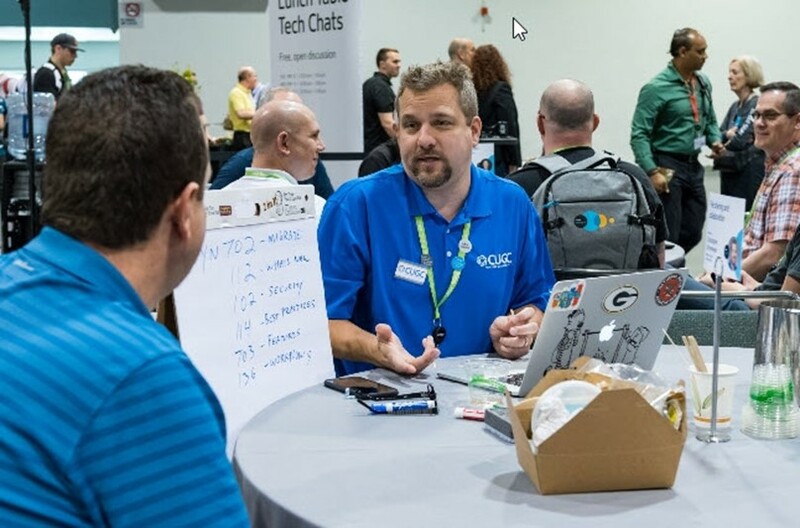 Citrix has an extremely large support community CUGC, Citrix Technology Professionals, and Citrix Technology Advocates just to name a few, with individuals that are passionate about the technology. Rest assured that you will never be alone in your journey. A personal thank you to our support team Stephanie Roper @Roperjs, Stephanie Boozer @Boozerette, Kimberly Ruggero @KLRuggero, and Perrine Crampton @pcrampton We wouldn’t be successful without them. Hope to see you next year at Synergy 2019 or a local CUGC meet-up. Thank you! VMware VMworld 2017 End User Computing and Digital Workspace Announcements Cheat Sheet! Citrix User Group Community (CUGC) Recap: The 1st Bay Area CUGC Meetup – Guest Blog Post by Donald Wong!